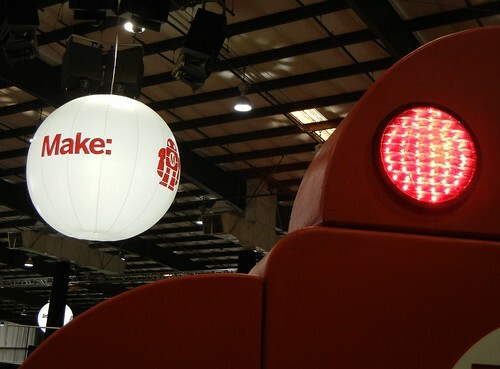 On Saturday, I had the pleasure of experiencing my first Maker Faire , an annual gathering of 10,000+ DIY enthusiasts, hackers, crafters, artists, cosplayers, and citizen scientists at a huge fairground pavilion in San Mateo. 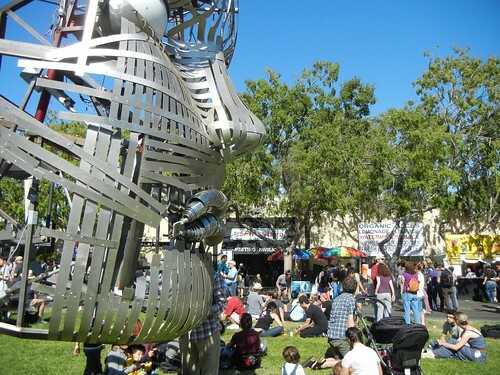 Described as a "festival of invention, creativity and resourcefulness, and a celebration of the Maker movement," Maker Faire is a multi-space, multi-event gathering where simply navigating the schedule of activities and demonstrations is intimidating! I went in with an open mind and and willingness to play, with a few talks in my schedule, but otherwise just letting serendipity guide me. I was not dissappointed. 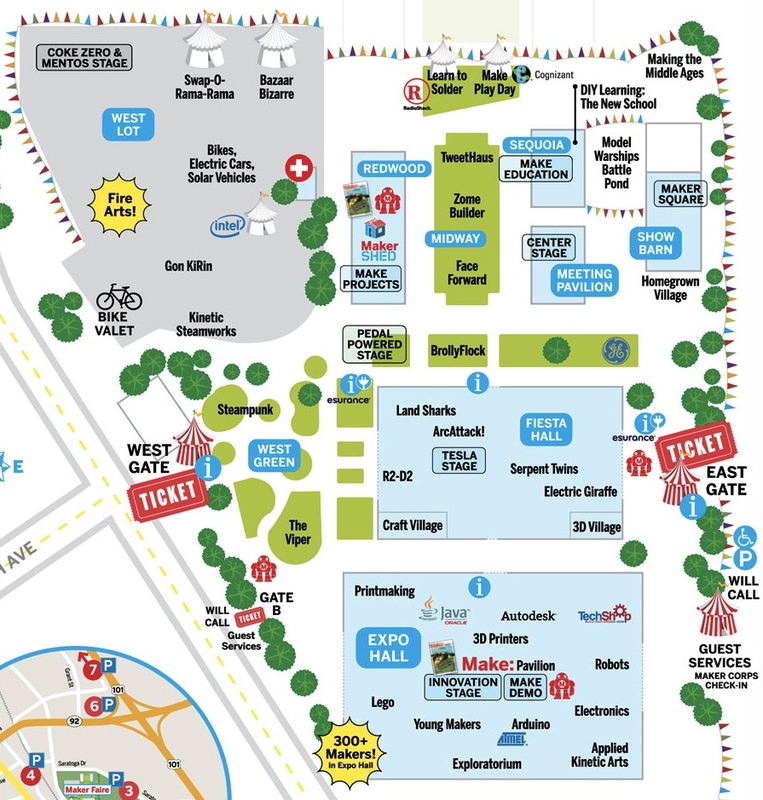 Entering the fairgrounds area, you feel like you are being transported to an alternate reality, one where mainstream, top-down commercial culture has been replaced with one where every person is not a spectator or a "market" but a co-creator. A giant dragon car slithers around the plaza, followed by a fuzzy green butterfly bus, and then a sassy talking red Dalek robot. Steampunk adventurers , giant mecha-warriors, and faeriefolk meander amidst the crowd. Interactive sculptures and installations beckon you to touch, crawl on, and play with them. 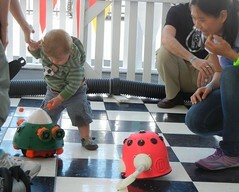 What impressed me first about Maker Faire was the huge numbers of families in attendance. Everyone from toddlers to octegenarians, often hand-in-hand, were wandering from area to area, experiencing the faire together. Seeing fathers and sons building robots or mothers and daughters controlling miniature battleships in a giant pool was really touching. I doubt whether my parents would be so hands-on and willing to try out new toys and technologies with me. 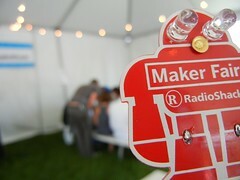 Radio Shack had a very popular tent where you could learn how to solder using a very simple kit laid out on picnic tables, staffed by friendly and patient volunteers. Kids and adults used soldering irons to assemble a neat little robot lapel pin with blinking LEDs. I sat beside a pre-adolescent boy who raced ahead of me to finish his, while I struggled to get my solder to lay properly on the battery pack. When the eyes of my little robot pin started blinking, I was inordinately proud and pleased with myself. I'm sure that feeling was replicated millions of times throughout the weekend by the attendees at Maker Faire. 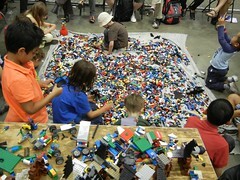 For younger kids, there were lots of places for them to play and experiment, from a huge legos area, a "robot petting zoo," a cardboard creation zone, and hundreds more. More "adult" activities included a very popular lockpicking booth, build-your-own electronics, crafting and knitting circles, and 3D printers every where you looked. The crowds got pretty intense at times, and yes there were long queues for the more popular exhibits and activities. But everyone was very friendly and helpful even in the crush of a crowd. I was there by myself and I was constantly chatting with people in the exhibitions areas and plazas. I felt like I was among my people. 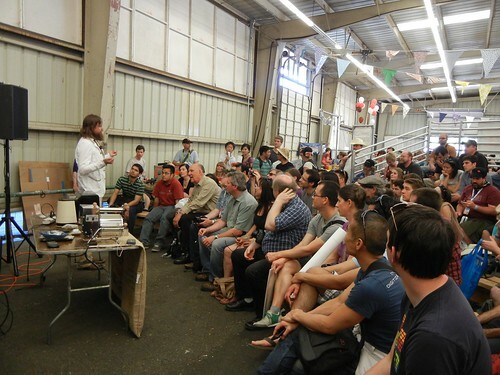 There were of course many talks and demos being given by different makers. One of the most enjoyable and informative for me were a couple of talks on coffee-cultivation and roasting given by Ritual Roasters and Sweet Maria's in the Bay Area. Participating in an interactive conversation between a coffee grower from El Salvador and a buyer from San Francisco was really eye-opening. I had no idea how complicated and sensitive the coffee cultivation and roasting process is. Afterwards I attended a demo and talk on DIY coffee roasting using common kitchen appliances, as well as more expensive home roasters. The coffee expert from Sweet Maria's explained how the different tools worked as they all roasted away, sending delicious scents of roasting beans among the audience. I even got a free bag of unroasted beans that I want to try out roasting as soon as I can. Lots of performers and entertainers kept the crowds happy during the day. The "pedal-powered stage" had bicycles set up where audience members could take turns keeping the power on so that the bands and artists could perform. I really enjoyed this Oakland-based hip-hop group Earth Amplified that was pretty hype and on topic! There were wonders around every corner: gigantic tesla coils, fire-spitting sculptures that sent waves of heat through the crowd, an entire Legos cityscape being built before you. One of the most eye-popping was a huge metropolis called "Tapigami" built using just masking tape that anyone could contribute to. Of course, a lot of merchandise was for sale. Not only could you buy lots of great hand-crafted goods, electronics, toys, clothing and art, there were also just as many kits , instruction books, and materials for you to go home and make your own cool stuff. I managed to escape only buying a tee-shirt, an iphone case, and a belt. 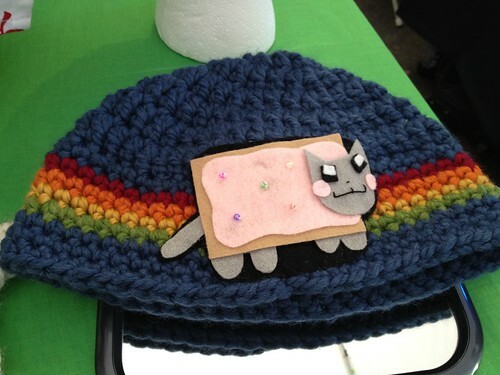 I was extremely close to buying this fantastic Nyan Cat skullie, but managed to resist. Much more importantly, I left the Maker Faire with a head full of ideas and inspiration for things that I wanted to learn how to create. I thought I understood maker culture before — but now I really appreciate how powerful and even revolutionary it is. I can't wait to come back!